Ace Attorney Dual Destinies is the first game in the Ace Attorney franchise in three years in the West, and five years since Apollo Justice Ace Attorney. Replacing its sprites for full 3D character models, excitement was high for this franchise’s return. It brings all the familiar gameplay you’re used to, but fails to reach the lofty heights that previous games ascended to. If you’ve played previous Ace Attorney games, you’ll understand everything almost immediately. Dual Destinies does not reboot the plotline, but acts as a perfectly fine starting point. Mild spoilers for the Ace Attorney franchise follow here, but it’s nothing the trailers didn’t already give away: After seven years without an attorney’s badge, Phoenix Wright reclaims his license to practice law. You’ll play as Phoenix Wright, his protégé Apollo Justice, and newcomer Athena Cykes over five cases, defending innocent clients against seemingly insurmountable charges. The gameplay is identical to previous Ace Attorney titles. There’s the investigation phase, where you gather evidence and talk to relevant parties to build your case. As always, this section is completely linear and impossible to fail at. Although the game brags that you can navigate a crime scene in full 3D, you can just press left or right to move to fixed positions. The older games already did this. Then, during the trial phase, you’ll listen to witness testimony, and present evidence that is in direct contradiction to the witness’ statements in order to win your case. If you have played any previous Ace Attorney game, you’re good to go here, but if this is your first time, it’s actually pretty thrilling. The statements from the witness are broken up into sections. If the witness is lying in a statement, and you can prove it by presenting evidence that contradicts what the witness is saying, you can do so. Otherwise, you can press a statement to get more information, which sometimes results in new testimony being added. It’s certainly nothing like anything you’ve played before, and sometimes the answers aren’t obvious. For veterans, note that this game is pretty damn easy. I never felt the urge to look at a FAQ to find a solution. Not even remotely, once. 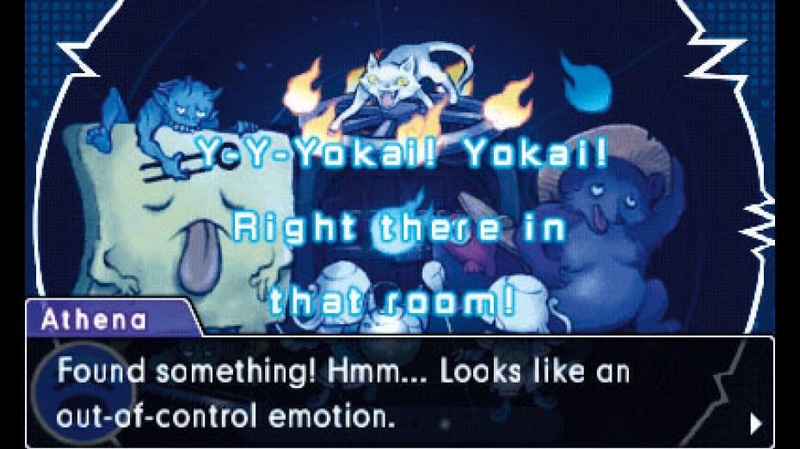 Some of the mechanics of previous games appear, such as Phoenix’s Psyche Locks which allow him to see when people are hiding secrets, and Apollo’s bracelet that tells him when people are lying. These segments only appear a handful of times throughout the entire game, and thus don’t even bother a mention. One aspect of the new Mood Matrix mechanic. More relevant is Athena Cykes’s Mood Matrix, a new system which is used during testimony to determine when witnesses feel inconsistent or unusual emotions during their statements, which can be used to help find the truth. To use the Mood Matrix, you simply read through a list of statements, then find the emotion that they are feeling which doesn’t fit and select it. This sounds simple, but is actually used to some creative effect in later cases. Without spoiling anything, the answer isn’t always obvious when solving a puzzle with this mechanic. What’s sad here is that earlier games in the franchise had more creative ideas. In one case from the original Ace Attorney game, you had to watch a video and point out problems in it. You could also manipulate evidence in 3D. Dual Destinies adds zero new mechanics beyond the Mood Matrix. Nothing adds character like bodily injury. The characters of Ace Attorney have evolved over time, and it shows. Phoenix Wright was a scaredy-cat who hung by the skin of his teeth in the original trilogy. However, the events of Apollo Justice Ace Attorney hardened him a bit and gave him confidence. He isn’t afraid anymore, and even talks down to the prosecution. Apollo Justice appears prominently in Dual Destinies as well, but the revelations of the previous game might as well have been forgotten. Still, the addition of Athena Cykes gives his character a bit more fleshing out, and allows him to stand on his own. Other characters from the franchise appear as well, though they’ll remain as surprises for you, the reader. 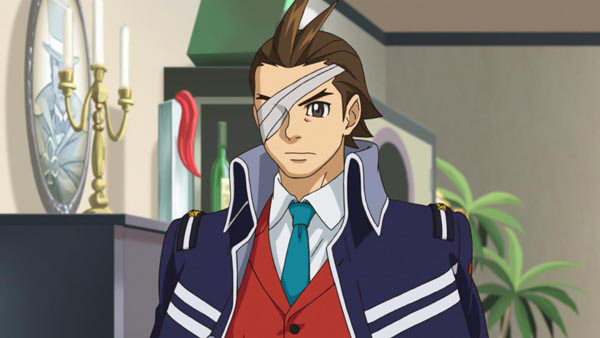 But probably the most unique character is this game’s prosecutor, Simon Blackquill. He’s currently serving time in prison, but that doesn’t stop him from challenging you at the courtroom, even when he is shackled at the wrists and ankles. I call him unique, but he’s not my favorite prosecutor in the series’ history. He’s simply not that… quirky. Ace Attorney prosecutors mix a level of gleeful malevolence with some kind of small, seemingly adorable weakness. Simon Blackquill just doesn’t go far enough in either direction to be super memorable. Rated M for Mature, kids. The thread tying this game’s cases and story together is the era of the “dark age of the law,” when false charges and phony evidence are in abundance, and what matters in the courtroom are results, not the truth. This “dark age” is referenced more and more as the game’s story is told, ultimately resulting in a chance for the protagonists to set things right and end the dark age of the law. Without spoiling too much, there’s a callback to events in Apollo Justice Ace Attorney. For the first time, Ace Attorney Dual Destinies has animated sequences which play at various points in the game. These are fully voiced, and it’s weird to hear Phoenix Wright’s spoken voice for the first time (like anybody plays him in Ultimate Marvel vs Capcom 3). However, for the rest of the game, we get the usual chirps as text appears on screen. Speaking of sound and presentation, the music is actually rather awesome, containing remixes of Phoenix Wright’s and Apollo Justice’s old themes, while adding some new tracks as well. Some of the music is incredibly nuanced and unusually bass-heavy. You might not be able to hear all of it without a REALLY good pair of headphones, though; I had to use an expensive SteelSeries set to hear the subtle tones. Some of the more ominous music is absolutely creepy. Arguably, this is the best music in franchise history. On the downside, the text in this game has enough typos and mis-grammared sentences that you wonder how much effort was put into translation. 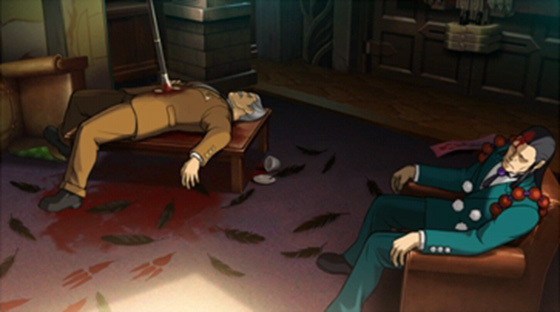 If you’ve played Ace Attorney before, you might have an idea of how this story ends. Sadly, it doesn’t reach the epic heights of Ace Attorney Trials & Tribulations, or the subversive mindgames of Ace Attorney Justice For All. The ending sequence was just… kind of confusing, which dulled its impact. It’s been a long time since we’ve seen it, but Ace Attorney Dual Destinies delivers a familiar gameplay experience to its fans. It plays it just too safe though, and doesn’t add anything really new to the experience. Ted played through the entirety of Ace Attorney: Dual Destinies in 30 hours. He didn’t play the DLC Case as it was not released at the time of this review. A review copy was not provided by the publisher. It’s still B.S. that it doesn’t come as a physical copy.